If you know anyone who’s deaf or perhaps you’ve just always wanted to learn sign language, this app is a great way to get you started. It’s actually designed to help parents with deaf children teach their infants to sign. When you first find out your child’s deaf it’s bound to be a little traumatic. This app will help make learning to care and interact with your child a little bit easier. It’s easy to use, and it can be used with the iPhone, iPod, and iPad. Most of us wouldn’t know where to begin when it comes to sign language. This app is a great starting point. The Lite version provides instructions for 120 different signs in easy to follow video snippets. Like any other language, you’re bound to experience a little bit of a learning curve as you begin your journey with sign language! It’s nice to know there’s an app to make your life a little easier. When you’re ready for the next step you can purchase the full version which has more than 300 signs. The lite version will require about 116 MB. This really is an easy app to use. When you open the app you’ll be presented with a list of all the available signs from A to Z. You simply tap on a word and a short video lesson begins to play immediately. In each mini-video there is a lady demonstrating the sign, followed by a quick explanation of how to form the sign with your hand. That’s all there is to it; it's simple and to-the-point. You can also search by category if you prefer. Tap on the Categories tab at the bottom and you’ll be able to view words grouped into various categories. For example, if you’re trying to teach your infant words related to bedtime routines there’s a category for that with a few different words. The main problem I had with the app was trying to use its other main feature. Next to each word you’ll notice a little heart icon. When you tap on the heart icon next to a word it’s supposed to save it in your favorites (another tab found at the bottom of the page), but every time I tried to do this the app shut right down. When I reopened the app, there was still nothing in my favorites tab. This wasn’t a make or break feature for me. I still found the app really useful, but it was definitely a little puzzling. Why have options in an app if they don’t work? When a parent first finds out their child is deaf they’re bound to go through a rollercoaster of emotions. This app is a great little tool to make the transition a little easier. 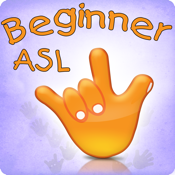 If you need, or want to learn sign language you won’t be disappointed with this app.